We Players’ first 2011 exhibition opening on Alcatraz focused on aesthetically presenting factual information about our current prison system in the United States. On Saturday, January 29th, We Players and the National Park Service presented live music and a talk with artist Paul Rucker, as well as screenings of his video Proliferation, in our gallery space inside the Alcatraz Cell House. The National Park Service and We Players are beginning the third year and final phase of our monumental collaboration on Alcatraz Island. This groundbreaking partnership has utilized site-specific performing arts programming to provoke critical thought and stimulate conversation on the themes of incarceration, isolation, justice and redemption. In addition to engaging the visiting public through site-specific rehearsals and performances, We Players and the National Park Service are creating lasting and transferable tools that use performance elements to augment Alcatraz interpretive themes as presented by the Rangers. On Saturday, January 29th, We Players and the National Park Service will present live music, a presentation titled “ Proliferation” that includes screenings, and talks by the artist, Paul Rucker, in a gallery space inside the Alcatraz Cell House. Please join us to continue this conversation, inspired by the history and present life of Alcatraz. In May of 2009, Paul was honored to be part of a Prison Issues residency at the Blue Mountain Center, a working community of writers, artists, activists and musicians in the heart of the Adirondacks. Amazing artists and activists from around the world provided over two weeks of inspiration, knowledge, and camaraderie. While doing individual research, he happened upon some maps created by GIS and CAD consultant Rose Heyer that showed the growth of the US Prison system. With that information, he was inspired to create Proliferation, an animated mapping of the US Prison system set to original music. If you would like to receive a free copy of the Proliferation DVD, email your name and address to paulrucker@gmail.com. You may also view Proliferation on YouTube and copies will be available on Alcatraz. Rucker is an interdisciplinary artist (cellist-bassist-composer-visual artist-creator of interactive sound/video installations) who has released two critically acclaimed CDs of his compositions. He composes new music presented in a way that allows the viewer-listener the opportunity to interact with the work (participants can trigger sounds with the wave of a hand, touch of a finger, or press of a button). Ruckers’ s pieces have been on display at high-profile galleries and conventions, and he has received numerous grants and has been awarded residencies to several prestigious arts centers worldwide. 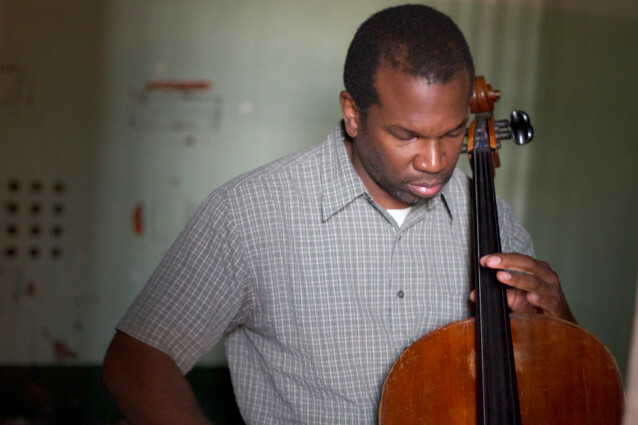 As a musician and director, Rucker plays in various situations from solo cellist to leading his large ensemble of twenty-two musicians. Visit www.paulrucker.com for more information.